YouTube announced an update to their stats pages yesterday, and although I'm still quite mad at them, statistics are something I can never resist. 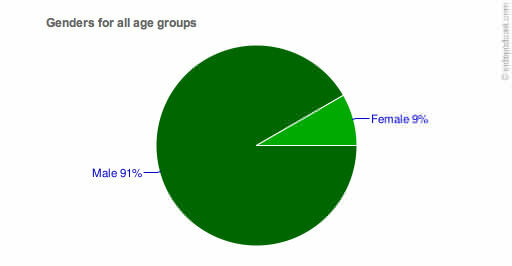 We like a good pie chart here at Sidepodcast and YouTube delivers the goods with their latest update, in fact we also get our hands on some demographics we've never had the opportunity to see before - ages and gender. First up I should say that this data set is slightly flawed, because it relies on viewers not only being logged into das tube, but also that they tell the truth in their profiles too. Additionally, it doesn't account for viewers logged in as someone else (as so often happens here when I browse using Christine's profile). That said, the charts are of a certain amount of use so for the basis of this post I've picked stats from last week's Turkey Preview video. It's been live for almost 7 days and offers plenty of data to work with (at the time the screenshots were taken 4,478 unique views). 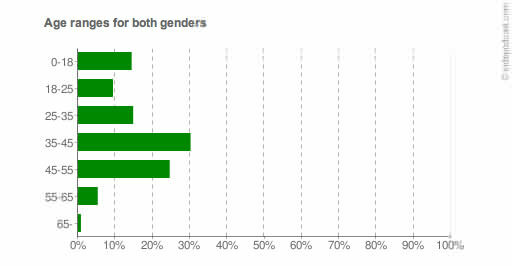 Of note, the two most popular groups are the 35-45's and the 45-55's. For some reason I imagined we were targeting a younger audience, in fact the group I thought we'd be targeting is the 18-25's but that's one of the least popular age brackets. Here we see a significant proportion of the viewers being male, but I'm slightly surprised that the female viewership isn't greater. Certainly a quick look on sidepodcast.com shows that three of the top five commentors are female. I'm not sure what we can glean from this information, whether it tells us more about YouTube's user demographics, our own viewer demographics or those associated with Formula One in general? As we don't have this information for our own downloads, we can but guess. What we can do is return and compare these figures against future shows. If you have any theories or spot any trends I've missed, do let us know in the comments as always. Previous post How much would you pay for this kind of F1 coverage?